They’re back: everyone’s favorite dragon-riding Scottish Vikings (well, they sound Scottish anyway). There’s always the question of whether a sequel will merely try to cash in on the success of its predecessor, or take the creative next step and deliver a satisfying story. How to Train Your Dragon 2 delivers. In Dragon 1, the people of the small island village of Berk live in fear of dragons. Their chief, Stoick the Vast (Gerard Butler), protects them as best he can. He remembers the day when dragons carried off his wife, leaving him to raise their son Hiccup (Jay Baruchel) alone. As the chief’s son, Hiccup is expected to learn his father’s ways and become a fearless warrior and dragon-slayer. Poor gangly Hiccup, however, is more brain than brawn. To earn his father’s acceptance, he captures a dragon — no less than a dreaded Night Fury. But unable to bring himself to take the wounded creature’s life, he befriends it, earning its trust and naming it Toothless. Thus begins the story of Hiccup’s coming-of-age: he, Toothless, and their dragon-riding friends save Stoick and the entire Viking fleet from disaster, and teach the villagers to live peacefully with their new winged friends. Dragon 2 begins five years later. Hiccup has grown, and is expected to succeed his father as chief. But he is reluctant, and struggles with his father over the right thing to do as a new threat arises. Drago Bludvist (Djimon Hounsou) is the requisite megalomaniacal madman trying to take over the world. When Hiccup discovers that Drago is building a dragon army, Stoick prepares Berk for battle. But Hiccup has other ideas: can he convince Drago to make peace? Hiccup is not the only one who has grown; so has the storyline. Weaving its way through the glorious animation is an emotionally deeper narrative than found in Dragon 1. Hiccup accidentally stumbles upon his long-lost mother Valka (Cate Blanchett) and her dragon sanctuary (like mother, like son). Her reunion with Stoick proves him to be, well, more vast than stoic. And there are surprisingly tragic moments in the story (I heard sounds of shock and dismay from a child behind me) that make Dragon 2 less friendly to its youngest viewers, albeit in a way that still feels redemptive by the end. 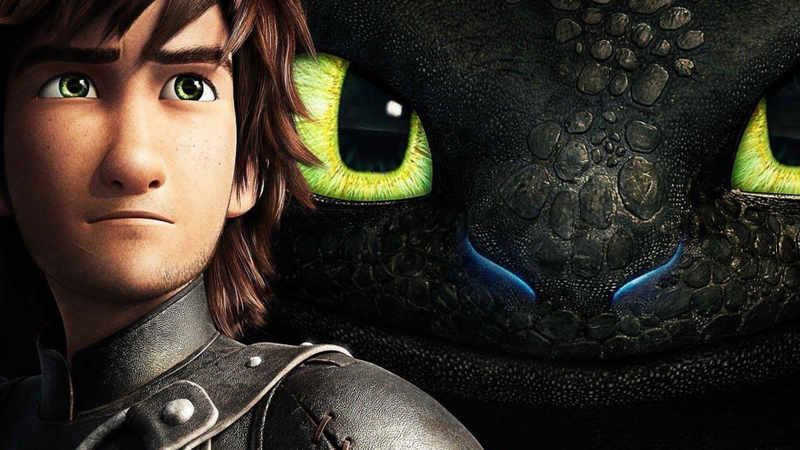 All the major characters from Dragon 1 return, including Hiccup’s early crush and probable fiancée, Astrid (America Ferrera), and their friends, including characters voiced by Jonah Hill and Kristen Wiig. But the real scene-stealer is Toothless, who moves and grooms like a cat, but cavorts like a giant puppy. That animators can wring so much emotional expressiveness out of a computer-generated mythical creature is truly wondrous. There are discordant moments. I’m uncomfortable with the choice to make Drago a dark-skinned and almost feral character with dreadlocks. The outcome of the climactic battle turns on an unexpected rabbit-out-of-a-hat twist (yes, it was telegraphed earlier in the movie, but feels narratively thin nonetheless). And to me at least, the whole ongoing matter of who is the true “Alpha” dragon is overplayed. Nevertheless, Dragon 2 is a delight. I’m reluctant to say, as some have, that it’s better than the original; I’d prefer to say that it succeeds in a different way. Parents of the youngest viewers should be prepared to discuss the more anxious moments of the story with their kids. But maybe every family could use a conversation about love and loyalty, and perhaps even the awkwardness, sacrifice, and cost of parents trying to do right by their children.